To have luscious eyelash is truly a blessing. How often we stare with awe at our Malaysian 'kawan', especially Indian ladies of their thick, long, beautiful eyelashes. Now, I WANT THAT VERY MUCH! In the past, I have endlessly attempt to create the thick eyelash look by applying fake eyelashes. 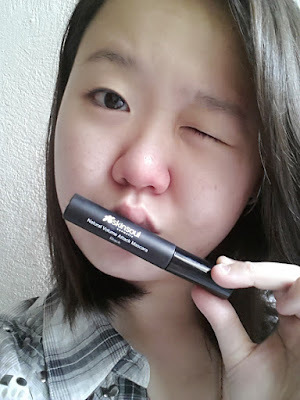 To begin, I have discovered a must have All-in-One cosmetic product from SkinSoul. 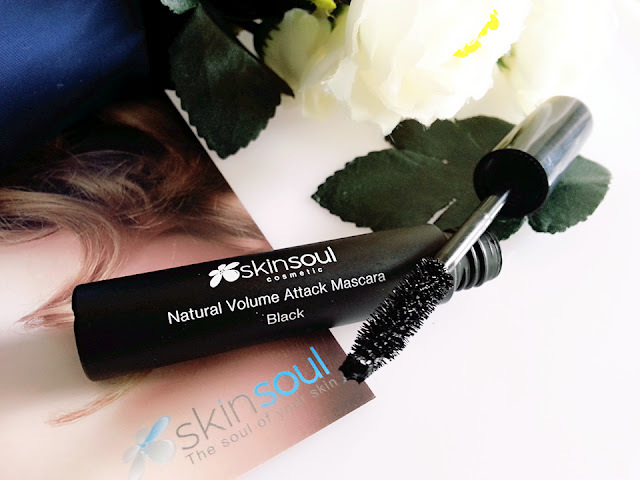 The Natural Volume Attack Mascara is one of SkinSoul's best selling product and today, I am going to share my thoughts on how amazing these beauty saviors are. Reasons that made SkinSoul Natural Volume Attack Mascara the best selling product. 1. Natural Mulberry Extract - Rich in polynutrients and vitamins that rejuvenates hair follicles, promotes hair growth, retaining natural hair colour and prevents hair fall by nourishing and strengthening lashes over time. The antioxidant property protects hair follicles from free radical damages. 2. Lash Curling Complex - Promotes seductively lasting curls from the lash roots. It is said that SkinSoul Natural Volume Attack Mascara is semi waterproof; Water resistant, yet easily remove with simple Eye Makeup Remover. The issue with me is I have watery eyes, which lead to my compulsive obsession with waterproof mascara. This mascara, to my personal opinion, is not entirely smudge or tear proof. 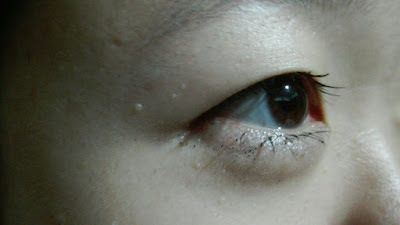 It does smudge a little on my lower eyelid when I tear, but that can be easily settle by carefully dap away those tears. The comfort of this is that the mascara is easily removed with gentle Eye Makeup Remover. Although the price is slightly above average, it is worth every penny as the results are clearly visible. 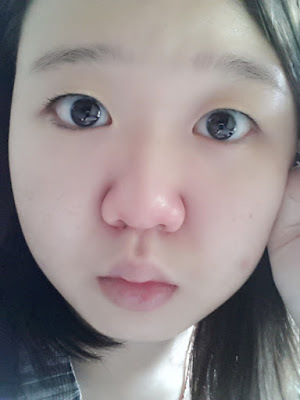 I have tried some lash serum in the past but the results weren't as quick to notice compared to SkinSoul's. My left eye used to be more *bald * compared to my right's but I noticed there are some significant change. This mascara also does not clump easily even with 3-4 layers which I find is very useful in creating bigger dolly eye look. *You can see the difference of applying SkinSoul Natural Volume Attack Mascara on my LEFT eye. Obviously, my eye looks bigger and you can see the curling eyelash. The formula is designed to be quick drying and long lasting (mine lasted more than 10 hours) despite some minor smudging. 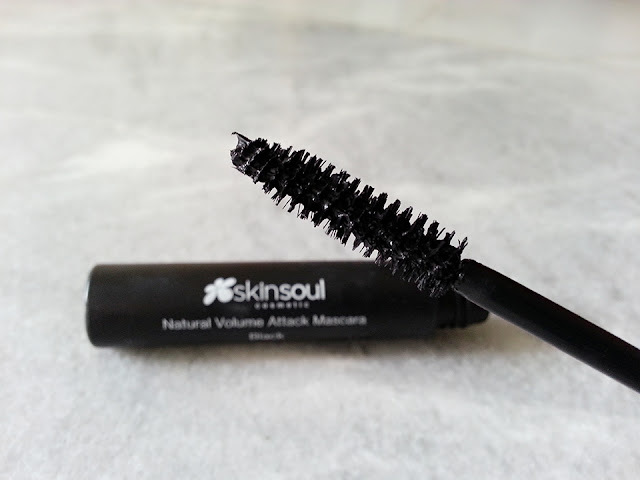 As the growth serum comes in the form of mascara, you have to constantly apply it, preferably during the day as I believe it's not a norm to sleep with your mascara on. Unless you are being sober from Friday Night or something. You can read more about them at the above links. Quote '#SSJuneci' the next time you walk into their outlet and redeem a complimentary SkinShield Travelling Set (worth RM100) with a minimal purchase of RM100 in a single receipt. I have tried this product before, it's really good. whoa! it enhance your lashes. Gorgeous! I've heard numerous positive reviews on SkinSoul already but haven't tried their products yet. Looks effective on you. yes it does smudge a little for me too...maybe i thought i have oily skin so everything smudge easily. just don't use on lower lashes for me. Skinsoul is one of the brand that I have not try before. The mascara looks promising too. looks good on you, thick and dark. nice one! I only use it once. Love the natural look it gave me. Love this mascara. I think it really works. I use this too. Yay thanks for the honest review. Not only did you state the benefits, you also state what is not that good. Thumbs up!